We are a family run, independent business that has been trading since 1989. Our aim is to provide excellent service at reasonable rates and, although we have expanded over the years to meet demand, we remain friendly, professional and approachable. 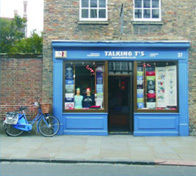 Talking T’s began life in the back room of a clothing shop in Cambridge’s lively Mill Road. 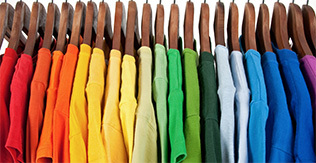 Shirts were printed and designed here and then sold in the outdoor craft market in the city centre All Saints Gardens. Life on the craft market was fun but very cold in the winter and in 1993 we moved the retail side to a small shop in Bridge Street near the Cambridge Quayside. This has proved a perfect spot both for sales of our own hand printed designs as well as a convenient base for some to place and collect orders. As both the custom printing and retail sales grew we took on more staff and moved the production to increasingly larger industrial units. 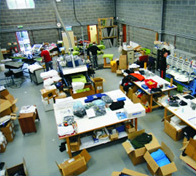 Then in 2010 we re-located to our own purpose built premises in Milton, Cambridge. With a large show room, great work space and easy parking it looks like we’re here to stay!